Hey guys! With the Trench Run release out of the way, we’ve been able to spend a little bit of time rounding out a KAG release. It should be out in the next hour or so on all platforms. 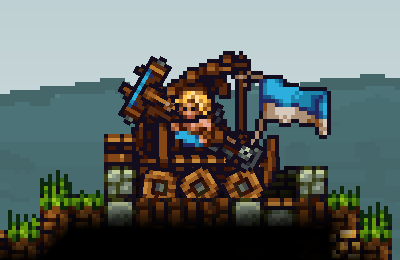 This release features a round of bugfixes and “finally” some balance measures on the ballista! Still deadly, but less spammable! Ballista and bolts now cost quite a lot more. The upgrade is also more expensive. This is intended to allow them to keep their role of dominating the battlefield in short bursts, without being prone to bolt-spam and spawn spam. Several bugs fixed with overlapping multiple Ballistae. The “Surrender” vote is no longer bugged – please check this is indeed fixed but all investigations we’ve done show it working as expected. It seemed to be relying on a bad seclev. Hopefully this means less end-of-game griefing and gives players a better “gg” out than nextmapping – a team can decide to throw it in together rather than relying on the enemy accepting. Officially extending the hand to KAG players everywhere to try Trench Run! There is also a one-time popup window which we will use for giving important information as required – we’re currently using it to plug an offer extended to KAG players for 30% off Trench Run! Use the code KAGLOVE30 when buying Trench Run here to claim your discount. As always, you can retrieve a steam key from the panel should you prefer to play your games through steam.